Thank you SO much to everyone who came to see us at NearFest. We had a truly wonderful time and we were all made to feel very welcome. There are some great pictures of all the bands taken by the official photographer Joe del Tufo, here. 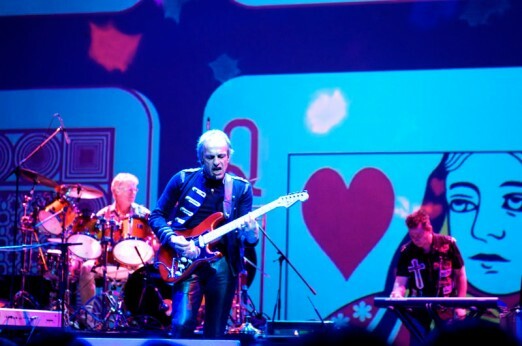 Many of you know that we performed our first US gig at NEARfest on 23 June. This event which has been running for many years, featuring many of the best known names in the prog-world, came to an end (or so they say) this year with the aptly titled NEARfest Apocalypse. There was a strong presence from the ‘old country’, including all 3 headliners Van der Graaf Generator, Renaissance, and UK, as well as us. As it was such a big event and a really great experience for us we have posted a separate full-length NEARfest review. Suffice to say – it was brilliant. Thanks to everyone who came and to those who made it so memorable. A few days before we flew to America we played a warm-up show at The Peel in Kingston. This was the only ‘live’ stage rehearsal the five of us were able to fit in before NEARfest, so everyone was understandably a bit apprehensive. Would Andy S be able to get to his piano and back in time for the guitar break in Take a Look? Would Brian’s cymbals shave his hairline during The Craft? Would Dean remember the intro to Blondon Fair, Roy the last few notes of The Poet? Would Andy F cope if Brian started The Poet too fast? All these questions and more – were answered during a thoroughly entertaining show. Thank you to everyone who came along, despite the appalling weather, and jubilee celebrations, to support us. Special thanks to (super-tech) Paddy, and Nick Powell for ‘doing the lights’.